Tokyo – The human brain is an exquisitely complex, organic CPU, made of trillions of connections between many billions of neurons. Understanding such a complicated organ is a massive scientific undertaking, and researchers often use simplified models to uncover small pieces of the neurological puzzle. The researchers took advantage of recent insights into how neurons behave; namely, that geometric shapes can help guide neurons, telling them where and how to grow. 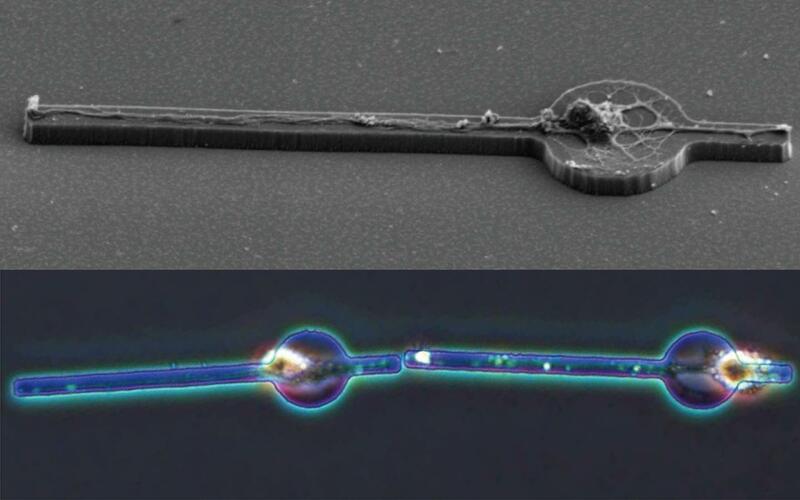 In this case, the team used a synthetic neuron-adhesive material to make a microscopic plate. The plate is circular with two protruding rectangles, somewhat resembling a bead on a tight string. They found that this shape guides neurons to grow in a very defined way: when placed onto the microplate, a neuron's cell body settles onto the circle, while the axon and dendrites – the branches that let neurons communicate with each other – grow lengthwise along the rectangles.